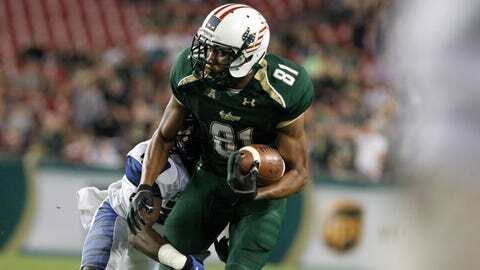 Wide receiver Andre Davis led South Florida last season in catches (49), yards (735) and tied for first in touchdown receptions (two). This is the fourth in a 12-week Friday series looking at the Wisconsin football team’s 2014 opponents. South Florida hasn’t produced a winning record since 2010, so that should be the initial baseline for Wisconsin football fans’ expectations for the teams’ Sept. 27 game at Camp Randall Stadium. While the Bulls have gone 10-26 the past three seasons, the Badgers have gone 28-13 during that same span. Willie Taggart enters his second year as head coach, and both he and the Bulls will be desperate for a turnaround. South Florida finished 2-10 last season, including 2-6 in the American Athletic Conference — ahead of only Memphis and Temple. Four times last year, the Bulls were held to single-digit points in losses. They also lost an embarrassing season opener to FCS foe McNeese State, 53-21. South Florida ranked No. 108 in passing offense last season (166.8 yards per game) and No. 120 in scoring offense (13.8 points per game). Only three teams averaged fewer points per game — UMass, Miami (Ohio) and Florida International. Two of those schools endured offseason coaching changes and none of the three won more than one game last season. The Bulls have done themselves no favors with a nonconference schedule in 2014 that features Maryland, North Carolina State and Wisconsin. But the matchup against the Badgers should be especially eye-opening. South Florida’s first four games all come at home. The only game on the road before October comes at Camp Randall, which will no doubt be packed to the gills. Personnel: Mike White will enter fall camp as South Florida’s starting quarterback, but it appears backup Steven Bench could push White for the top spot. White didn’t exactly set the world on fire in 2013, when he completed 53.1 percent of his passes for 1,083 yards with three touchdowns and nine interceptions. To be fair, White didn’t even appear in a game until late October, when the Bulls’ coaching staff opted to burn his redshirt season as a freshman. Bench, meanwhile, appeared in seven games last season and completed 40.6 percent of his passes for 392 yards with two touchdowns and three interceptions. During South Florida’s spring game in late March, Bench completed 20 of 34 passes for 174 yards, though he did have the benefit of playing with the team’s likely starting receiving group. "One spring game doesn’t do it for us. I feel we have two quarterbacks who can get it done for us," Taggart told reporters after the spring game. "It’s amazing what competition will do, but it’s also amazing what experience will do. There is a synergy among our offensive linemen that gets things going for us." At running back, sophomore Darius Tice will be the leading returning rusher (35 carries, 141 yards, no touchdowns). Senior Michael Pierre, who rushed 41 times for 114 yards last season, also should see time in the backfield. He led all running backs during the spring game with 15 carries for 78 yards. Still, South Florida’s running game is one Wisconsin likely will not fear. The Bulls averaged just 2.96 yards per carry in 2013 — better than just seven teams in the FBS. Wisconsin, meanwhile, averaged 6.62 yards per carry — second in the nation behind only Ohio State’s 6.80. Receiver Andre Davis, who led South Florida last season in catches (49), yards (735) and tied for first in touchdown receptions (two), returns for his senior season. Davis was among the spring game stars after catching six passes for 124 yards and a touchdown. Senior Deonte Welch also could give South Florida some long-range punch. Welch hauled in eight catches for 123 yards last season and made five catches for 108 yards with a touchdown in the spring game. Other receivers likely to contribute are Chris Dunkley (seven catches, 87 yards last season) and Alex Mut, who did not make any catches a year ago but did nab six passes for 41 yards in the spring game. Senior tight end Mike McFarland, a 6-foot-5, 260-pounder, will be a threat as well. He caught 23 passes for 288 yards with two touchdowns last season. Senior linebacker Reshard Cliett is the team’s leading returning tackler after amassing 56 tackles with seven tackles for a loss. Sophomore defensive back Nate Godwin (49 tackles), sophomore linebacker Nigel Harris (35 tackles), sophomore defensive back Johnny Ward (32 tackles) and junior defensive back Kenneth Durden (32 tackles) also return. Still, South Florida loses six of its top 11 tacklers, including defensive lineman Aaron Lynch, who was taken by the San Francisco 49ers in the fifth round of the NFL Draft. Lynch was a first-team all-conference pick as a sophomore last season after recording six sacks and 12.5 tackles for a loss. First of two: Wisconsin and South Florida will play a return game at Raymond James Stadium in Tampa, Fla., in 2017. The Badgers have a home game scheduled against Florida Atlantic but need to fill one other nonconference home slot. Rushing attacks: Talk about two different types of running games. South Florida averaged 88.7 yards rushing per game and scored four touchdowns total on the ground last season. Consider that Wisconsin’s third-string tailback Corey Clement, who carried only 67 times, scored seven rushing touchdowns. Wisconsin rushed for 283.8 yards per game (eighth in the country) and scored 35 touchdowns on the ground. Strong kicker: If South Florida has one advantage on Wisconsin, it’s certainly in the kicking game. While Badgers kicker Jack Russell continues to struggle with consistency, South Florida possesses one of the best kickers in college football. Senior Marvin Kloss was one of three finalists for the Lou Groza College Kicker Award last season, becoming the school’s first-ever major college football award finalist. He made 18 of 23 field goals and led the nation with 11 made field goals of 40 yard or more and four of 50-plus yards. He also set the school record by hitting 13 straight field goal tries.